The AE-18 has an extra durable microphone making it great for a variety of ages. The microphone adjusts both up and down, as well as closer to the user's mouth. The padded vinyl earpads are easy to clean for multiple users. 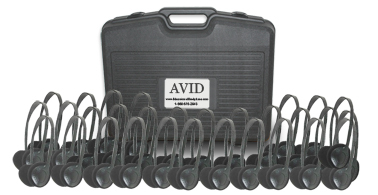 The Classroom Pack includes thirty (30) Headphones and a Carrying/Protection/Storage Case.